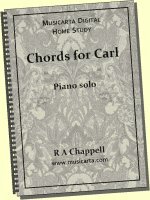 Which chords should I learn? What’s the best way to learn them? Let's take a look at how the Musicarta Key Chords study pack answers those questions. The chords in a song or piece of popular music aren’t random. Chords group naturally in ‘keys’ and are made up from the notes of the scale of that key. There are just six naturally occurring key chords – three major and three minor. To become a creative ‘in charge’ keyboard player, you need to know a bit of theory – specifically, how chords come from scales, in any key. This is strictly ‘need to know’ theory of solid practical use, but it still lifts you above just following the dots and is well worth the effort. You would start by learning a set of those, thoroughly, in one key, and then add the most-likely minor chord. You will then know the four chords which account for the largest fraction of all the popular music ever written and played. There’s a slight complication! Even the simplest three-note triad (chord) comes in three inversions, with a different note at the top of each. Better-sounding music moves between closest inversions, so your first task is to be able to switch between the three major chords – in three different inversions. Key Chords Volume I covers the four chords you are most likely to find in any piece of music in any key. Not just theoretically, but practically, with great off-the-shelf riffs that will put these essential chord changes under your fingers in a fast-track to real contemporary keyboard proficiency. In a word – methodically! 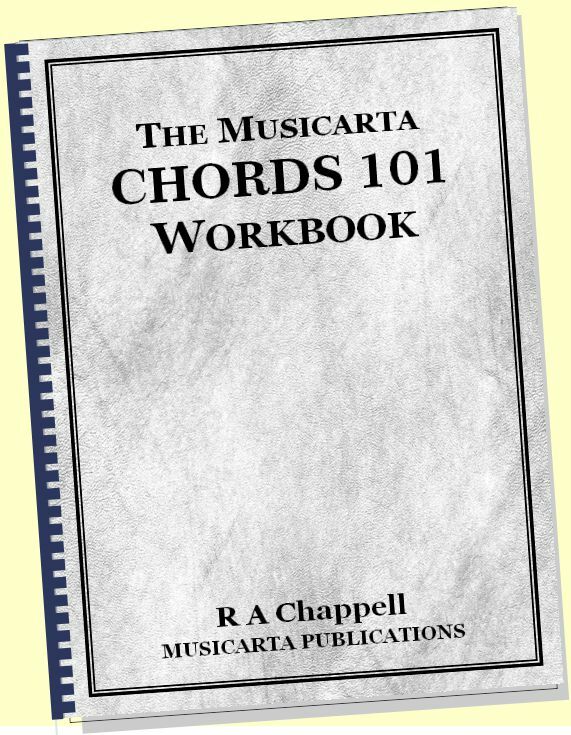 The Musicarta Key Chords workbook splits the task up into bite-sized pieces. 1. You find nearest-inversion pairs of I and IV chords first (e.g. chords C and F in key C), and drill them in a syncopated keyboard riff. 2. Pairs of chords I and V (C and G) are next, with their own riff. 3. The pairs are then combined in a three-chord riff which swings conveniently through the home key. This is an example of a Musicarta syncopation build-up. You play the simple chords first, then add syncopation in small doses. Any one of the stages would do as a riff. Each stage has its own audio and MIDI files you can loop, watch and slow down until you can play along. Only then do you learn a riff which jumps directly between the three chords. Here, you hear a drill for working through the three sets of closest inversions. It’s thorough, it's methodical, it works – and it’s good music! All sounding rather familiar? Of course it is - the ‘I, IV and V’ chords are the bedrock of popular music, and having them at your fingertips is an absolute necessity! Playing by ear automatically becomes much, much easier when you realize that most of the music you hear, in any genre and any key, is built around just four chords. Key Chords Volume I covers these chords and builds 'in the bone' aural skills by drilling chord changes that will improve your ability to nail that next chord a hundred-fold - guaranteed! Popular-styles keyboard playing is often very rhythmical. Playing the chord material you learn in a modern, syncopated way can seem like the most difficult part of the enterprise. 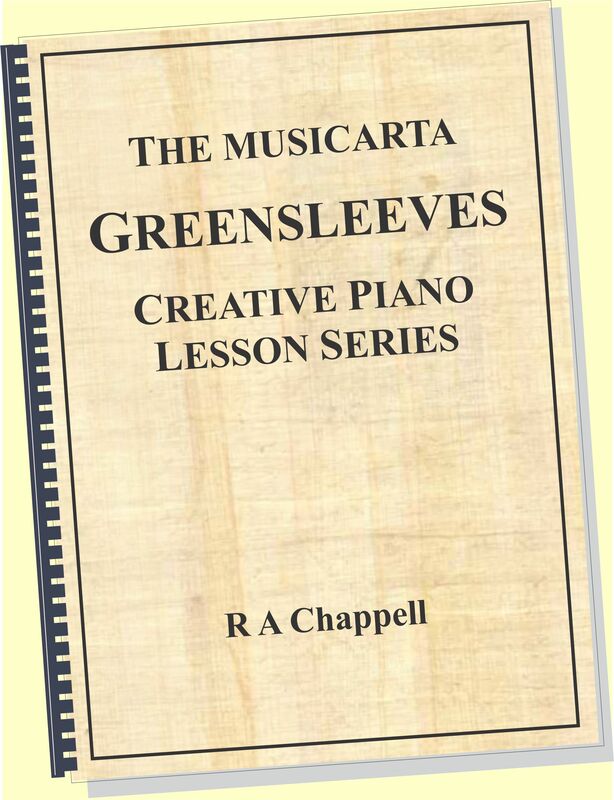 Musicarta specializes in teaching keyboard rhythm skills methodically. Audio and MIDI files coach through rhythmic build-ups which make advanced syncopation achievable. Each stage in a build-up is a free-standing riff – you always come away from a Musicarta session with something in the bag! 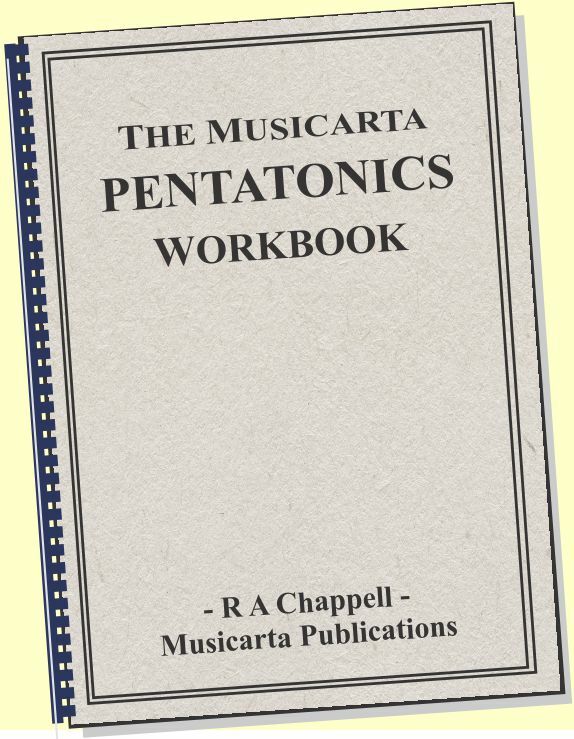 You've already heard an example of Musicarta's rhythmic coaching in the syncopation build-up (two audio files up the page). Key Chords II/III shows you in more detail how Musicarta's patient, painstaking approach saves you hours of frustration putting that irresistible swing into your playing. Playing popular-styles chord material in the modern, syncopated way can often seem to be the most difficult part of the enterprise. Musicarta is the field leader is coaching keyboard syncopation skills in a methodical way, with demonstrations of step-by-step build ups which will make "It's no good! I can't do this!" a thing of the past! This is your workbook, professionally formatted with fully linked table of contents and internal navigation. 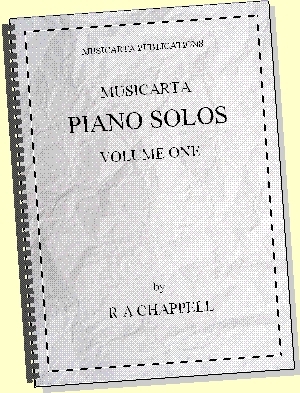 All the written-out musical examples have audio and MIDI files. Drum tracks to support your practicing and inspire your improvisations are included. Use MidiPiano (Windows version) to play the project MIDI files. 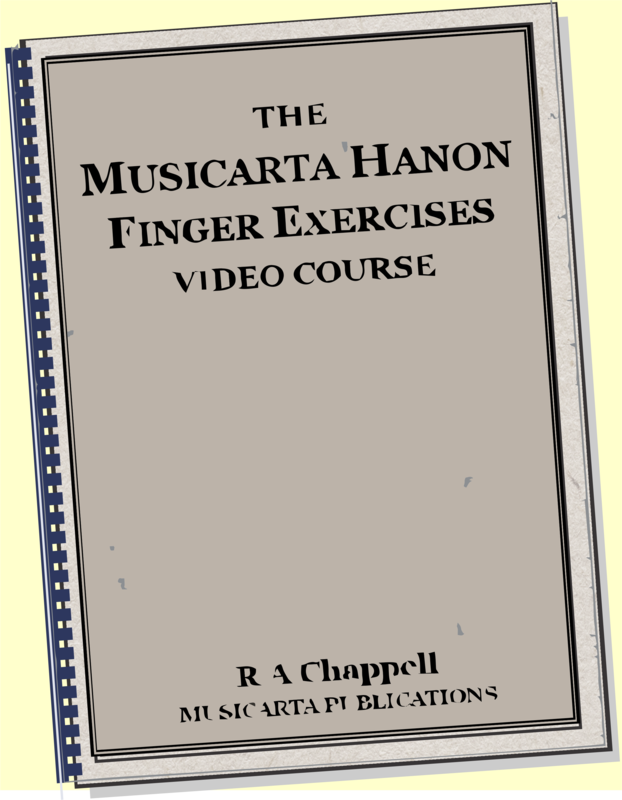 Watch the colour-coded hands play while an intuitive ‘Piano Roll’ view of the music scrolls across above Watch the demonstration videos on Mister Musicarta YouTube. 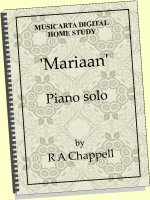 A collection of Musicarta reading music flashcards and other relevant visual aids to help you ‘see the music in the keyboard’. You can pay for Key Chords with PayPal or your regular credit card. The download is hosted with industry leader e-junkie– once your payment has gone through, you are sent a secure personal download link and can download at your convenience. Musicarta is 100% committed to seeing you get your Key Chords study pack, and no problems have been experienced with e-junkie to date. 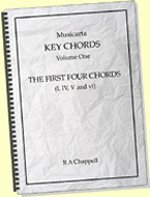 The rest of the Key Chords sampler pages give you more of a flavour of what Key Chord Volume One covers and what studying with Key Chords will be like. You can also purchase directly from those pages. Feel free to browse using the Key Chords links in the right hand column section navbar.